That leaves us with Soccer and Hockey. Both of which I’m what one would call a casual fan. I enjoy watching them some, but I don’t know the players’ names and positions, even for the teams I watch. Soccer is my biggest sports interest, and for professional soccer, I’ve seen two Columbus Crew matches, My First Columbus Crew Match and Once More with the Crew, This Time With the Boys, I’ve written about before. Then there’s hockey, which I watch the “home team” Columbus Blue Jackets… home team in that they are the closest Ohio team (well… only Ohio team) in the NHL. 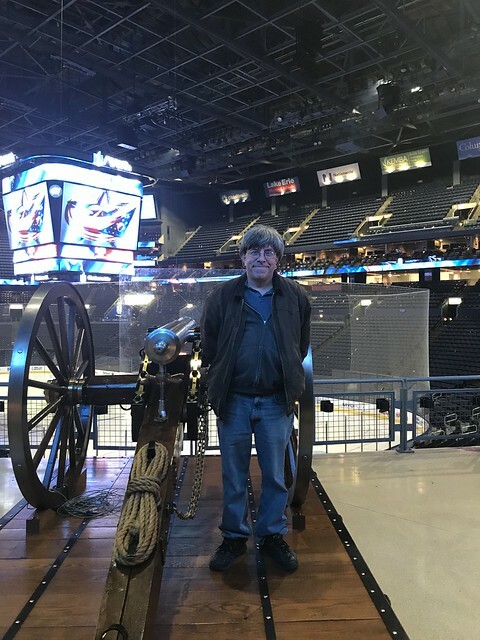 I once took the boys to a Cleveland Monsters (The Columbus Blue Jackets American Hockey League affiliate… think AAA baseball compared to major league, Columbus sends players up and down from Cleveland, it is still professional, just not major league) game… which they lost… but… Well… at Least There Was A Fight, which I wrote about before. 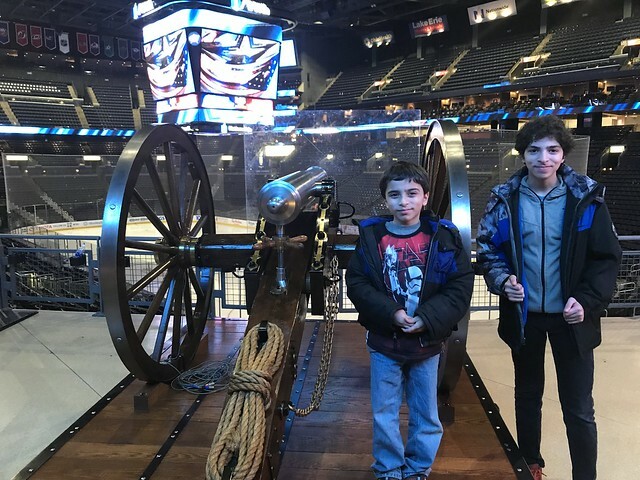 Which brings us to a trip the boys and I took to Columbus to watch the Columbus Blue Jackets vs the Detroit Red Wings on 3 March 2018. I wanted to see the Columbus Blue Jackets vs Pittsburgh Penguins on the 5th, but the more affordable seats were already well long gone. Pittsburgh is after all one of, if not THE chief rival for the team and fans, so it’d be the bigger more exciting game. On the bright side, the Detroit game should have been an easier win… should have. I picked the boys up, and seeing we were running ahead of schedule we detour into the Dave and Busters in Columbus… this turns into a small mistake as we stay longer than I planned, and I had started getting a headache before going in, and it was pretty bad by the time we got out (probably for not eating lunch, and the stress of the long drive). The original plan was to eat (more on that in a bit) and then go to a board game store down the road from said food place, then to the Nationwide Arena for the game, and in the end, the board game store plan had to go to the wayside due to running late. In retrospect we probably could have killed the time at the store, ate, and then had more time to settle in at the arena. Our first real planned stop was the Wendy’s in Dublin, across from their Headquarters. 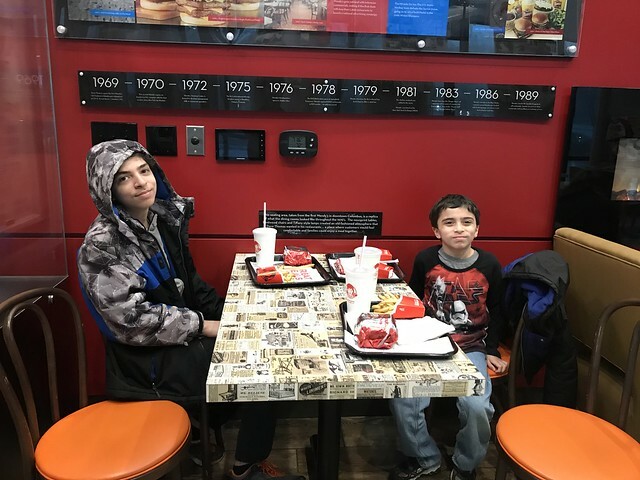 My youngest is a bigger fan of Wendy’s than I am, and I thought he’d appreciate the museum portion of it. Here we are sitting in the museum portion. We make it to the arena, and I settle for the closest parking spot to the arena, mostly as I have kids, and it is raining. Twice as expensive, as in $20, but an okay value as it is supposed to be raining after the game as well, not to mention there are thunderstorms in the area, so the less walking in the rain we can do the better. Inside we make a beeline for our seats, above the cannon (more on that in a bit) and 4 rows short of the top. Then go take a look at the Columbus Blue Jackets’ Cannon. The cannon has a unique spot in professional team sports. 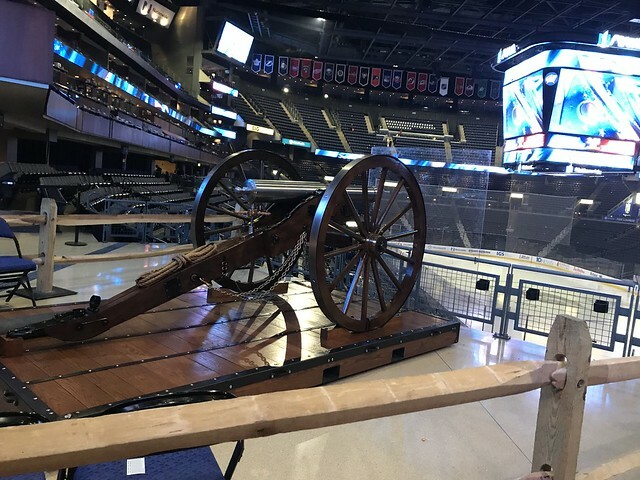 At the start of the game at the Blue Jackets take the ice, after each time the Blue Jackets score a goal and after a win, they fire the cannon. This sounds semi-loud on TV, but in person, it is even louder. It is a full replica of a Civil War cannon (a hand-made replica 1857 Napoleon cannon). This picture was taken after the game but is the best picture I have of just the cannon itself. The Detroit Red Wings came out and scored. Columbus answers back during a power play. Detroit roars back, another goal, then get a power-play goal. By the end of the first period, Columbus is down 3 to 1. It’s still early, but a disappointing start. I’m thinking, well, at least we heard the cannon a couple times. Our tickets include a food voucher, a hotdog, popcorn and a small non-alcoholic drink. A heck of a deal… even if it is Pepsi products. 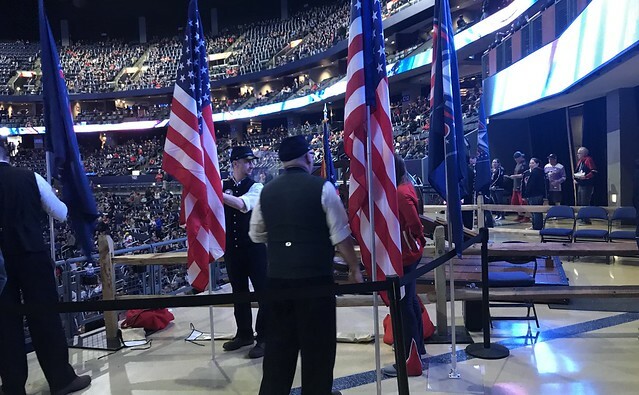 If you are going to Columbus Blue Jackets game, check out the Columbus Dispatch Family deals, as the seats are decent, and the extra value of the food put the deal over the top. We get our food and settle back in for the second period… and OMG, did Detroit score again? It is now a 4 to 1 game. The crowd is quiet. A Blue Jackets player goes down after a puck hits him in the back of the head, but is able to skate off on his own much to the crowd’s relief. I’ve seen enough hockey to know that even if the player hurt is a visiting team, fans still cheer when the player is able to leave on their own… people can be good. 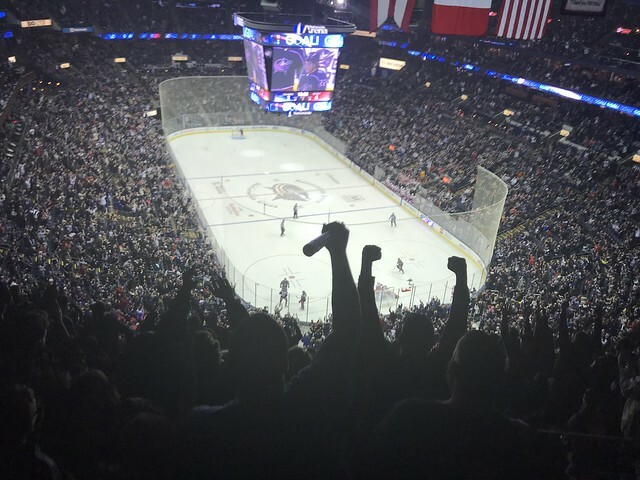 Columbus finally scores in the second period, the place goes crazy. … and is challenged… and upheld… place goes crazy again… so does my youngest who dabs. The end of two periods and it is 4 to 2 in favor of Detroit, but don’t count Columbus out. They were behind against Edmonton 3 to 0 and ended up winning that game 7 to 3 not that long before…then again they had just come off a loss in overtime against Vancouver… Third period and Columbus ties it up. Afterward, we take another set of pictures next to the cannon, sadly the cannon crew isn’t around to get us all three in one shot. We head to the team shop… even cheap t-shirts are over $30! We skip getting more stuff than we already have. We head out the door… wrong door… we wonder one way… nope… head the other… nope… back the other way and around a good bit of the arena, in the pouring rain… so much for parking close to avoid the rain. Make it the car and wait ten or fifteen minutes, and traffic is good. The exit ramp is closed but Waze finally gets us going home, and we roll in well after 1 AM. 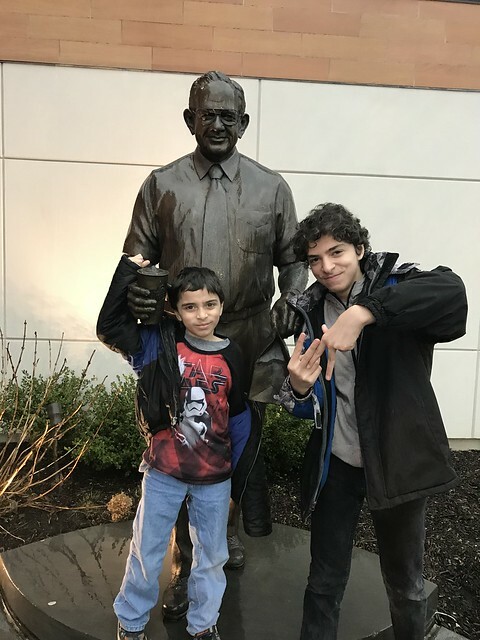 All in all, though, I had a great time, and I think, even if the boys go mostly to humor me as they are less into sports than even I am, they had a good time as well. If I lived in, or near Columbus (one can only dream), I’d probably go more often. It was a fun time.